Ah, the fun of video storage - it may not be the sexiest of the filmmaking disciplines, but it’s a critical part of the workflow. With file sizes getting ever bigger - to store 4K, 5K and, wait for it, 8K resolution footage, the demand for speed, space, and reliability is greater than ever. Californian based G-Technology is one of the major players in the industry trying to ensure that the back end up keeps apace with seismic capture changes happening at the front end. As part of the Western Digital group, which also includes SanDisk, the company boasts a broad skills and research base and pulls from different areas of the business to drive the development of it’s pro-end drives. 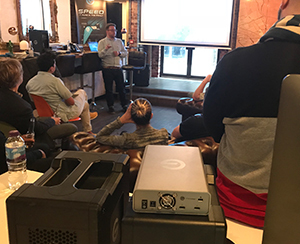 G-Technology recently unveiled its latest line of drives at a launch event at Jigsaw 24’s London offices. The triumvirate of new drives provide some impressive read and write speeds that would leave even the most data heavy motion graphics artists salivating. The new storage systems are not cheap, but G-Tech’s sales pitch is ‘more time saved at the office leaves more time to tell stories’ - so spending a bit extra on super fast drives could be a long-term money saver. And when I say super fast, I mean staggeringly fast. Each model in the new range of drives comes with Thunderbolt 3 connectivity and the top-specced G-Speed Shuttle SSD can transfer 1 terabyte of data roughly 4 hours of 4K footage - in just seven minutes now that’s fast! The Speed Shuttle SSD has up to 8 SATA SSDs in a portable RAID unit and it can shovel data at rate of 2,800 MB/s for both reads and writes. Team it up with the right graphics card and computer and it has enough oomph to edit multiple streams of Apple’s new Pro-Res raw footage significantly reducing the pain of having to wait for hours as it churns your beautiful high-res footage into grainy proxies. Judging by the direction of travel for the industry, this type of souped up system might become the norm sooner rather than later as VR and higher resolutions become ever more main stream. The Speed Shuttle is also future-proofed, to a certain extent, as it comes with the ability to switch the SSDs for higher capacity units that might become available down the track. Its relatively small stature and weight means it can be stored away in a Peli case and carried on location. It comes in both 8TB and 16TB flavours with punchy price points of £4,399.95 and £6,569.95 respectively, plus additional £259.95 if you want to splash out on the bespoke Peli-case. The second new product is the Mobile Pro SSD, which is small and compact but still exceedingly zippy. It’s drop proof from up to 3 metres and can allegedly be run over by a car, which any busy videographer will tell you is reassuring to know. It’s available in 500GB, 1TB and 2TB sizes and its light weight, slimline design is good for editing on the run. Again it’s not cheap coming in at £569.95 for the 500GB variety and £899.95 for the 1TB size. Bearing in mind you can purchase a 5TB drive (all be it a considerably slow one) for just over £100, there’s a serious choice to be made. That said, if you can afford it, what price for being able to copy across your footage in super quick time at the end of a very long shoot? The new G-Drive Pro SSD, which looks similar to the traditional G-Drives with the cheese grater front, based on Mac designs. It’s designed for video editors who are working their machines 24/7 editing and exporting during the day, ingesting and uploading over night (or vice versa!). Featuring two Thunderbolt 3 ports, to provide the option of daisy chaining, it also offers read and write speeds of well over 2000MB/S. The price is £1,199 for a 1TB, £1,799.95 for a 2TB, £3,549.95 for a 4TB and £6,569.95 for an 8TB. I haven’t had an opportunity to put these drives through their paces yet, but there’s no doubt that on paper the speed and reliability stats really stack up.